I’ve already been canning this season. A lot of people hear this claim and wonder just what it is that I’m canning. The first food I started canning is soup. I get the ingredients from my freezers. Anything that’s starting to get a bit old is fair game. I also save the larger bones from various meats, especially when I have the meat processed by someone else. The meat and vegetables made into soup can quite well and last a lot longer than they would in the freezer. Nothing is quite so nice on a cold winter’s day than hot soup. I usually get two or three servings out of each quart that I can (sometimes four if I add enough additional items). Given the cold winters here in Wisconsin, I can go through a lot of soup. Once I can the soup, the freezers are less full, so it’s time to defrost them. It’s essential to defrost, clean, and reorganize your freezers every year. Doing so lets you create an inventory of what you have in stock so that you have a better idea of what you need to grow. In addition, you don’t want to keep items so long that they become unpalatable and visually unappealing. Freezer burned food is completely safe to eat, but you may not want to eat it. Some of the ways in which you can prevent freezer burn is to vacuum pack your food and to ensure you rotate it out before it sits in the freezer too long. In some cases, when food is mildly freezer burned, I’ll make it up into pet food (my animals don’t seem to mind as long as the food is prepared to their liking). However, it’s better to use the food up before anything actually does happen to it. So far I’ve made 14 quarts of chicken soup and another 14 quarts of venison stew. Canning soup means using a pressure canner. Make sure you follow the instructions in a resource such as the Ball Blue Book and the book that comes with your pressure canner. Read Considering the Dangers of Outdated Canning Information for details on keeping yourself safe when using the Ball Blue Book. It’s also time to can early garden items. For example, when canned properly, rhubarb makes a highly nutritious fruit dish that I eat directly from the jar. You can also make it into pie filling. So far, I’ve made up 7 quarts of plain rhubarb and 7 quarts of spiced rhubarb, both of which will be quite tasty this upcoming winter. Fortunately, you can use hot water bath canning techniques with rhubarb and other high acid foods. In some cases, you need to mix and match items. The frozen green and wax beans in my freezer weren’t getting any younger, so I used them to make up four bean salad. Actually, it’s supposed to be three bean salad, but some of my recipes called for Lima beans, while others called for kidney beans. I decided to use both, hence four bean soup. I used up all the remaining beans and garnered 16 pints of four bean salad on my larger shelf. Doing so also used up the cans of kidney and Lima beans in my cabinets. Finally, pickled asparagus can be quite a treat in the middle of winter. So far, I’ve only made up 8 pints of pickled asparagus, but I’ll make up more. I’ll also be freezing some asparagus for fresh use later in the year. In short, canning season has started—time to get going! Let me know about your current canning project at John@JohnMuellerBooks.com. I’ve written a number of posts about the effects of global warming from a personal perspective. It does make a difference in how I view the whole issue of global warming. Whether global warming is a matter of cyclic world changes, human interaction, natural sources, or some combination of thereof isn’t the point—the point is that the earth is getting warmer, which is causing changes of various sorts that affect me as a person. Your best way to deal with these changes is to make a list of how they affect you and come up with effective strategies for dealing with them. This summer saw a drought come to our area. There is more than a little evidence to say that the drought is just another effect of global warming. People focus on droughts during the summer months because crops are affected, grass dies, and the heat becomes oppressive. The television, radio, and newspaper blare pronouncements of impending doom from dawn till dusk each day. However, the winter effects of drought can become even more devastating than those in summer. Consider the fact that snow acts as an insulating blanket for the earth. It helps retain some of the heat in the deep layers. When there is a lack of snow, frost tends to go further into the ground and cause all sorts of nasty consequences, especially during a heavy freeze. My reason for writing about heavy freezes is that we’re experiencing one here in Wisconsin and I’m concerned about the potential of damage to either my well or septic system. Nothing is quite as exciting as living almost four miles from town and not being able to use any water because your septic system is frozen. Once frozen, you need to call a professional to thaw the system so you can use it again. If your professional is especially busy, you may be waiting for a few days. The problems of deep frost aren’t limited to the well or septic system. A deeper frost creates more heaving—water freezes and the resulting ice displaces some of the earth underground. The most conspicuous result of heaving is that any pavement on your property buckles and doesn’t last nearly as long as it could. It’s possible to assign an actual dollar amount to the lost longevity of your sidewalks and driveway. The effects can also profoundly affect your house’s foundation. Heaving also causes myriad other problems for the self-sufficient person. For example, those posts you put in for your grape vines will become misaligned—forcing you to spend time readjusting the cables and possibly damaging the vines. A deep frost can kill tree, vine, and permanent bed plant roots. You’ll also have the pleasure of picking more rocks from the garden come spring because heaving brings them to the surface (despite the perception that they grow there during the winter). I’m also wondering how a deep frost will affect our new chicken coop (despite having put the posts as deeply as we could in the ground, heaving will still have an effect on them). There is also the direct heating costs to consider. A blanket of snow on your roof acts as additional insulation. When this blanket is removed completely, your house loses more heat. Of course, there is also a problem when there is too much snow on your roof (causing damage from the weight) and the whole issue of ice dams. However, during this time of the year, a nice insulating layer of snow can save heating dollars. Drought causes serious problems during the winter as well as the summer. No matter where you live, you have to consider the effects of drought on your property and the structures it supports. What sorts of winter drought effects have you see in the past? Do you think the increased number of droughts is due to a natural cycle in the earth’s weather pattern or from global warming (or possibly a combination of both)? Write me about your drought observations at John@JohnMuellerBooks.com. This is the time of year when our lovage plant soars and develops seed heads (ours is about 6 feet tall this year). We use the stems and leaves in place of celery. The celery taste is quite strong, so you use less lovage than you do celery in a soup or salad. Even though you can use every part of the plant, we only use the seeds, leaves, and stems. Because the celery taste is so strong and the lovage cell walls don’t lose the volatile oils that give it its taste easily, you can dry lovage and use it as an herb all winter long. You don’t use all of the stems on the plant. The larger stems that form the stalks for the seeds are tough. What you want to dry are the tender stems and the leaves, especially those near the bottom of the plant (shown here with our rabbit gardener). The plant gets so tall that the wind tends to knock it over before the seeds mature. To overcome this problem, we place the plant in a tomato cage. You can just barely see the tomato cage peaking out in this picture. Even with the tomato cage in place, a really strong wind can still knock the plant over, ruining the seeds. 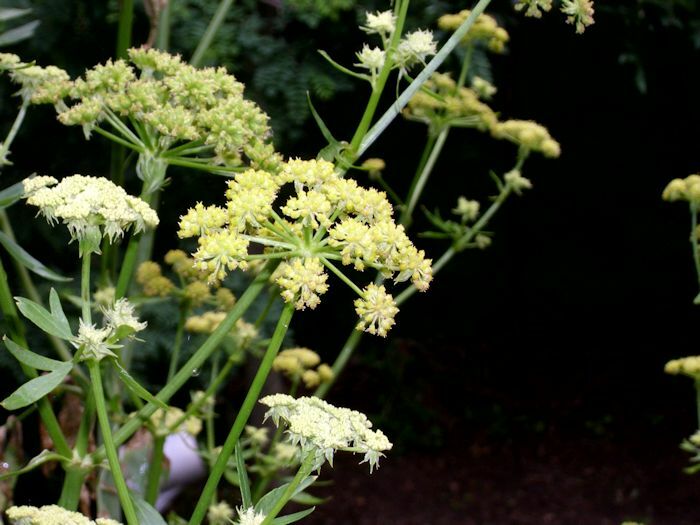 One of the things that most people don’t realize is that when you buy celery seed in the store, what you’re actually getting is lovage seed. The seeds have a strong celery taste and are used in a many of ways (none of which we’ve ever tried). One of the uses that we’ve thought about is creating dye from a tincture of the seeds. A number of sources say that you can create both permanent red and blue dyes using lovage seed, which would make it quite versatile indeed. The lovage flowers are quite pretty and the bees seem to love them. 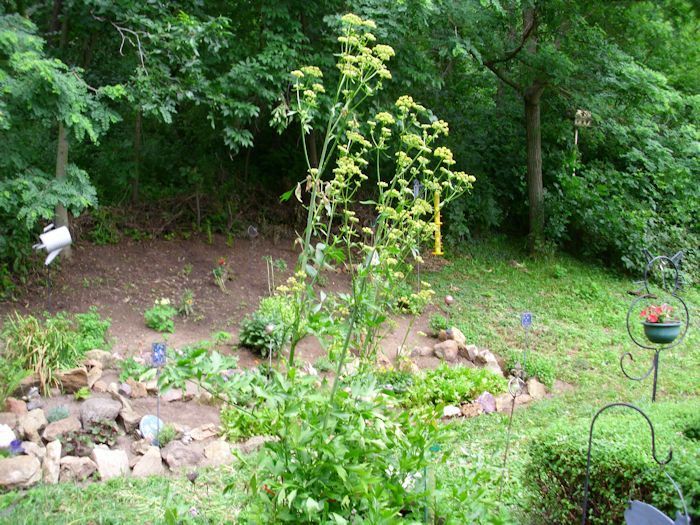 Lovage is a perennial and it’s nearly impossible to kill. It even survives Wisconsin winters without a problem. Every spring the lovage plant comes back up. The plant will continue to grow in circumference year-by-year. Eventually, you can break the plant apart into sections and propagate it much as you would rhubarb. 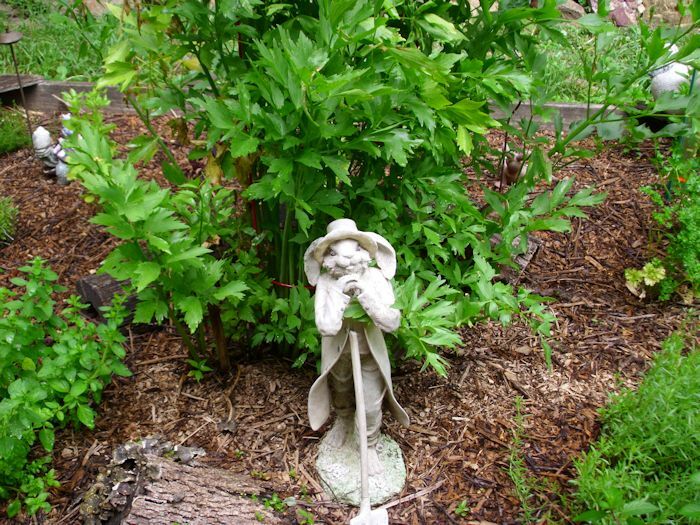 Unlike mint, lovage won’t run amok in your garden. It stays put. So you don’t need to worry about growing it in a container or digging out invasive chunks of it each year. Lovage is extremely long lived. This particular plant is 15 years old and shows no sign of giving up yet (it gets stronger year-by-year, in fact). We planted it in a location that gets full sun from around early morning (but not at sunrise) to early evening. Have you ever tried lovage? If so, how do you use it? If not, I highly recommend this herb for everyone who likes the taste of celery. Let me know your thoughts about lovage at John@JohnMuellerBooks.com.